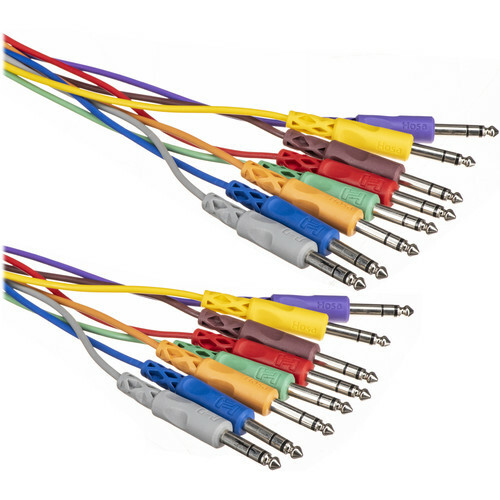 The Hosa CSS801 is a 3.3' (1 m) eight channel stereo male 1/4" phone to stereo male 1/4" phone snake cable for audio production applications. Box Dimensions (LxWxH) 12.0 x 7.0 x 2.0"
CSS801 8x Stereo 1/4" Phone to 1/4" Phone Snake Cable - 3.3' (1 m) is rated 4.0 out of 5 by 3. Rated 4 out of 5 by Anonymous from These patch cables are Just Fine Hosa is usually regarded as a less expensive (read: cheaply made) brand of cable, and in some cases I would argue it's not appropriate for heavy professional use. However, I use this snake to connect an interface to a 1/4 patch bay in a mobile rack, and since cable stays connected and relatively secure, there are no issues and the weak points of this cable (molded plugs, somewhat thin cable) aren't much of an issue. At this price, these cables are a great deal, and the one meter length is great for single rack use. Rated 5 out of 5 by Just Ice from definitly worth the money I use this cable snake to record 8 channels of audio from my mpc2000XL to one of my roland vs recorders.it allows me to separate the audio track by track .in short this cable is awsome! Rated 3 out of 5 by mrderwerk from Not bad Normally I steer clear of Hosa products. However, this snake was cheap and should be sufficient for my home studio. Cheap build quality; I wouldn't take Hosa cables on the road.